First aid is at the heart of St John. 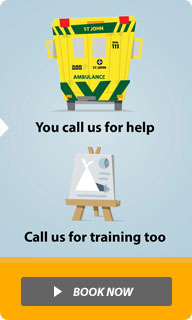 In addition to our ambulance services, we provide training courses, kits and supplies, AEDs and smartphone applications. We also provide up-to-date first aid information right here on this website – tips, quizzes, videos and online training courses. Our first aid courses range from a basic Level One right through to advanced resuscitation training for health professionals. This section provides general information for anyone thinking about taking a training course. Find out the why, what, where and much more. A defibrillator is a lifesaving piece of equipment that can increase the chance of heart attack survival by up to 40%. Through St John you can purchase a first aid kit that’s right for your needs. We also sell supplies to refresh your existing kit. This First Aid Library provides all New Zealanders with a valuable practical guide to first aid for a range of common emergencies. St John offers expert first aid advice about specific emergency response situations. Promoting a community of lifesavers. The GoodSAM app is now available in New Zealand, supported by St John, Wellington Free Ambulance and the National Cardiac Network.